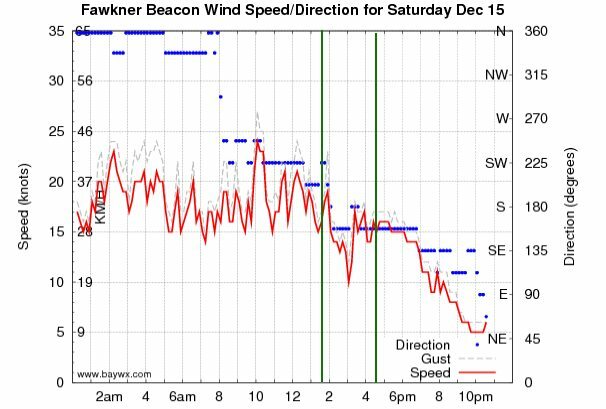 Some unexpected wind sprang up around midday so we headed down to Hampton and got there at about 1:35, just in time for the 20 knot wind to drop to less than 15. 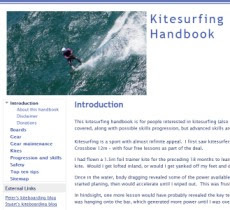 I rigged my kite and flew it on the beach for a while chatting to Stu Styles, who is keen to start kiting to supplement his great passion for windsurfing. The wind picked up a bit so I headed out on my surfboard. I had to sine the kite a lot to keep the power up, but this is easy with the smooth and fast turning Lithium 12. After one short run out and back I decided to change over to the Sector 60 board so I set it up. Everyone else left the beach but then the wind picked up a bit so I headed out again. Its amazing how 12 knots feels like 18 when you get going on the Sector 60. I attempted a Duck Tack (sort of) but still find it quite difficult to visualise how to to do it. I worked my way upwind, then the wind picked up to 15+ so I was going well. It was nice touring up to Black Rock up past the Cerberus. I was intending to keep going to Rickett Point, but I noticed one of my large fins was coming lose - I didn't do the screws up tight enough. They are impossible to tighten without a screw driver so I headed back directly to Hampton, keeping my fingers crossed that the fin wouldn't come out. It was a blast going downwind. This time I flew the kite right around to the other side - the key is to keep it turning to it comes back and keeps generating power. I did a few downwind kiteloops that were easy and provided some extra boost. Some large yachts were racing just off the breakwater so I threaded my way through them carefully and fanged in to the beach. The fin was still there, but only just. Memo to self: do the fin screws up tight! Looking at another kiter's Sector 60 V3 after the session I noticed they have two large surface mounted screws for each front (large) fin, which is a much more secure fixing that the single screw on mine. He said it doesn't carve turns as easily as the V2 - which is the opposite of what the information from Airush indicates. I had a short rest on the beach after I tightened the screws. A kid flying a stunt kite crashed it hard millimeters from my kite - if he had hit it there would have been some serious damage, but luckily he just missed. I did another couple of runs and was finding it hard to make the gybe turns in the lighter wind. A did a total distance of 26km but it felt like more. Its good training for Across the Bay to Conquer Cancer fundraising event I am participating in around Australia Day 2013.